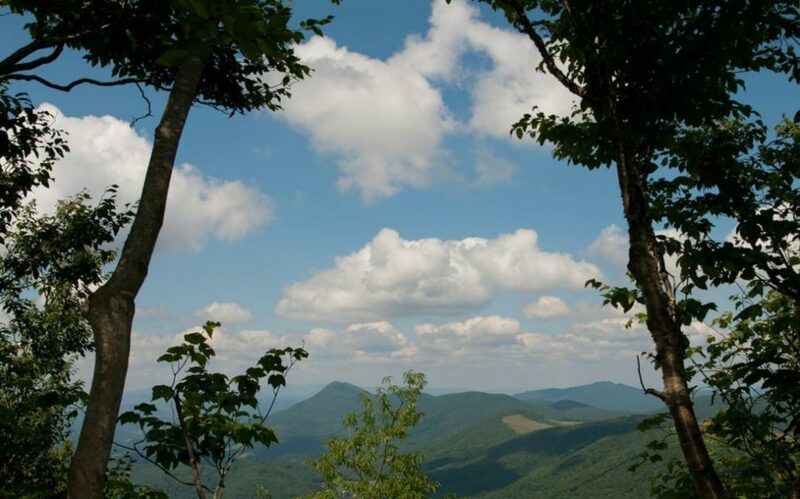 The nearly 3,500 wild acres of Elk Knob State Park, which includes the second highest peak in Watauga County, was nearly lost to developers in the early part of the 21st century. The area was being considered for the construction of a summer home community until a group of local landowners and concerned citizens, together with the efforts of The Nature Conservancy, purchased the land and deeded it to the North Carolina Department of Parks and Recreation. Today, Elk Knob is one of North Carolina’s newest state parks, open year round for the enjoyment of hikers and naturalists who are drawn to its scenic beauty and unusual ecology. It lies within a small mountain range north of Boone known as the Amphibolite Mountains, named for their unique geological foundation. Amphibolite, a dark, crumbling metamorphic rock, disintegrates into a rich soil that plays host to rare plant species such as Flame Azalea, Purple Fringed Orchid, and Gray’s Lily. The soil is inhospitable to the type of heath shrubs that typically choke the ground floor of Northern Hardwood forests. In the absence of mountain laurel, blueberries, and rhododendron thickets, the forest feels wide open and expansive, a unique characteristic for the peaks of Appalachia. Rosy Bells, Trillium, Starflower, and Jewelweed carpet the ground in vivid hues during the spring and summer. You may find yourself breathing more deeply than you have in months. Although there are some decidedly steep and strenuous sections en route to the summit of Elk Knob—the longest of the three trails currently constructed throughout the park tops out just shy of four miles round-trip—it’s generally a nicely switchbacked and straightforward route for most hikers. A gently rolling one-mile loop encircles the picnic area. Moderate trail lengths make the park a popular destination for families, trail runners, and afternoon adventurers—but don’t forget the real reason to visit Elk Knob. As one of the highest peaks in the Appalachians, the summit of Elk Knob boasts an exceptional tri-state view of North Carolina, Tennessee, and Virginia, including Mt. Mitchell, the tallest peak on the East Coast, fifty miles away in the Black Mountains. The experience at the summit is one of unparalleled quiet, only interrupted by the occasional whistling of High Country winds that rush up the side of the mountain. Winter adventurers will experience a summit feathered in hoarfrost, and dazzling views of rippling, white-frosted mountains without having to brave the cold for too many hours. Elk Knob State Park is located off of Meat Camp Road in the community of Todd, North Carolina, 9.5 miles outside of Boone. Picnic tables, grills, and restrooms are available. First come first serve campsites can be found along the Backcountry Trail; there are two group sites that require reservations.